A model for what Canada’s national anti-poverty plan could look like. We Need A Plan. We Have A Plan. In a country as wealthy as ours, 4.9 million Canadians, or 1 in 7, struggle to make ends meet: to pay rent, feed their families, and address basic needs. Over the past 5 years, Dignity for All has garnered support from 15,000 people in Canada who believe it is time for the Federal Government to step up and take responsibility for this country’s impoverished populations. 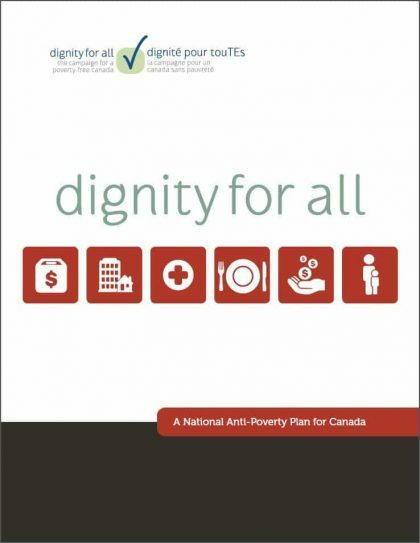 With the input of people living in poverty, faith groups, organizations, academics and others, Dignity for All has created a model national-anti poverty plan. The plan has three main policy goals that target six areas of focus. We call on the government to allocate the resources needed and legislate a comprehensive federal plan to eradicate poverty. This collaborative document gives a model for what Canada’s national anti-poverty plan could look like. Together, we’ve done the work. We need a plan, and we have a plan. We believe that the federal government can have a plan too. As the government sets a Canadian Poverty Reduction Strategy in its sights, we want every policy maker to know that there is a model plan that they can use to act on poverty eradication. Pour lire le plan en français, cliquez-ici svp. Why a Federal Anti-Poverty Plan? While charity is necessary in helping people survive right now, it doesn’t address poverty’s root causes. A comprehensive approach that guarantees a right to food for all people in Canada is key to eliminating poverty. But we still don’t have a plan. The federal government controls income security payments, tax benefits, pensions, and the vital funding for provincial/territorial health and social service programs. The federal government is responsible under international human rights law to eradicate poverty. Committees from the House of Commons, Senate, and the United Nations have all said that Canada needs a Federal Anti-Poverty Plan. Now that a plan to develop a Canadian Poverty Reduction Strategy (CPRS) has initiated consultations, we need to ensure that this plan is comprehensive, rights-based, and reflects the dignity of all people. Help spread the solution by sharing the plan online, with friends, and with your MP! Find your Member of Parliament!